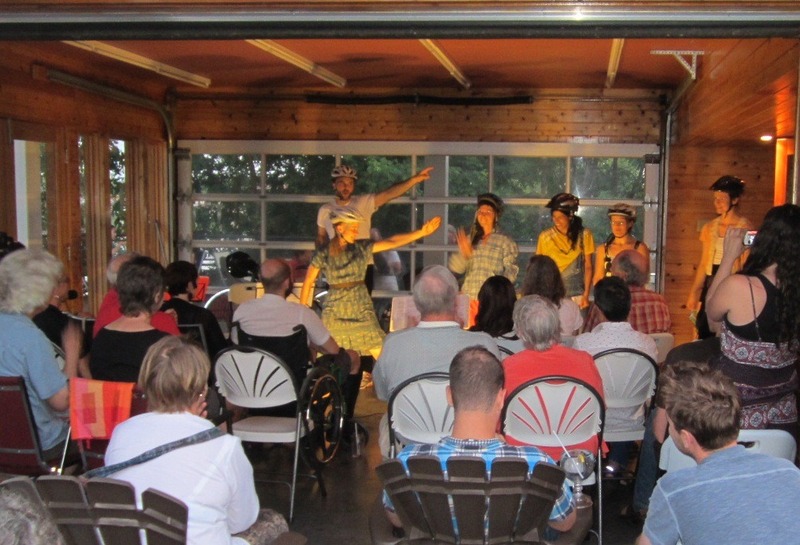 The evening was perfect: the heavy heat of the day was passing, a cooling breeze kept things fresh and there was no sign of rain as a small crowd eagerly gathered Monday night at the Silver Bean Café for the Peterborough (and first on-the-road) performance of the Bicycle Opera Project. While there was nothing specifically bike themed in the musical selection for the evening, apart from an oblique connection to one piece from “Rob Ford: the Opera”, the full bike racks and faces of the usual cycle suspects in the crowd gave clear evidence that the pedal-powered venue-to-venue concept of the Project had intrigued Peterborough’s bike community. Oh, yes, there were opera fans there, too. And no one was disappointed, cyclist or opera fan alike. With a backdrop of one of their bike-trailer combinations (Norco-Croozer), several sets of chess players out on the patio and the shimmering river, the ensemble delivered a series of short, easily digestible and enjoyable pieces, all with important social themes (if you include saving teddy bears from zombie pirates as social good–which we do). The evening featured a range of contemporary pieces by living Canadian composers, some, like the ensemble, very young and at the start of their careers. The pieces were each relatively short and moved along at a good pace, no doubt pleasing those less versed in opera. The audience was clearly engaged and appreciated the quality of the performing, the range of emotions, the immediacy of the singing and music and the many comic turns throughout the performance. It was all very fresh, vibrant and, in total, a very enjoyable performance. After the show there was plenty of conversation, some about the pieces performed, some indicating appreciation for the performance in Peterborough and others that focused on the logistics of the tour, especially the bike-trailer combinations. It was, by all turns, a very magical evening. Small photo essay on Tumblr. Tickets are also available by calling 647-785-4935. Reserve your tickets ASAP (there are a limited number) and tell all your friends! Go to their Indigogo page here to make a supporting donation. Do you have contacts in any of the tour destinations? Help them find places to stay! ← Previous Previous post: Bike Spotting: Bikes for thristy riders?